I think I had this false idea of clean for a long time. Come cold and flu season during my college years, I would spray everything with a product that shall remain nameless because I'm totally ashamed I ever used it. I shouldn't have let it enter my house to begin with. It burned my nose when inhaling it cleaning a tiny space like my bathroom. It also made me cough whenever I sprayed it, and it even made my skin feel like it was on fire while scrubbing with it. What was I thinking? Wouldn't all those things individually, and even more so combined, be a huge indication that it wasn't "cleaning" so much as replacing my germs with harsh chemicals? 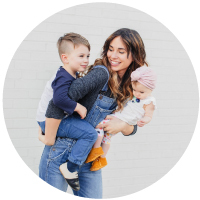 I've since had two kiddos, and done a lot more reading on what is being put into a lot of our household items. This book is super informative... and on Amazon #Free2DayShipping because #AmazonPrime. That sad truth is a lot of the "bad" things we consume are entering our home because it's more convenient and it's cheap. Of course, not everything that is expensive means it's better, but that old saying "you get what you pay for," can be very true. 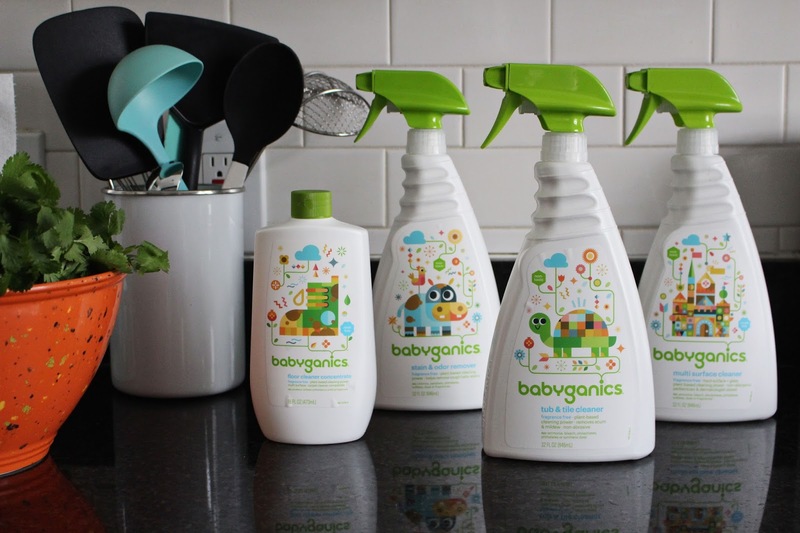 So, unless you've got time to concoct all your own cleaning supplies, and find the perfect formula that works just how you want it to, try the Babyganics cleaning line. Cleaning those cold and flu germs out of your house is so important. With all the holiday get togethers you'll be hosting, those germs will be sneaking in like Santa Claus coming down the dang chimney. Babyganics All Purpose Surface Wipes are fragrance free. I use them for everything. 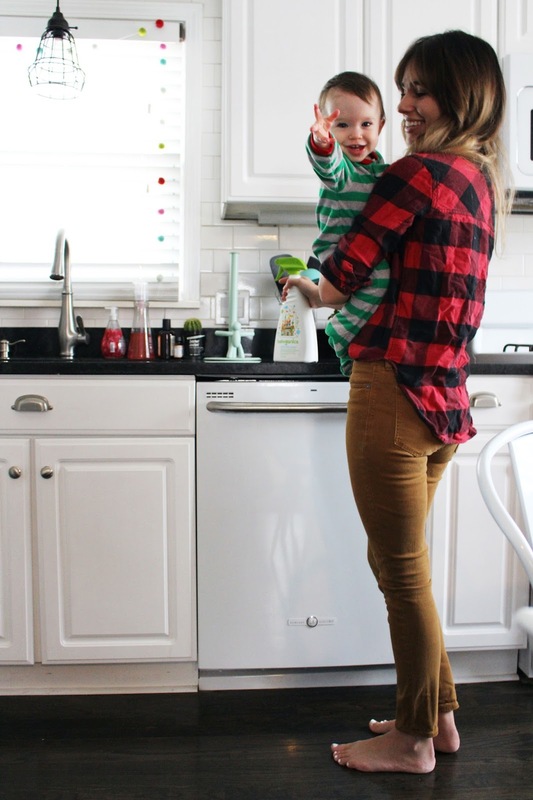 I wipe down all the door knobs, the fridge handle, the dishwasher, the table. 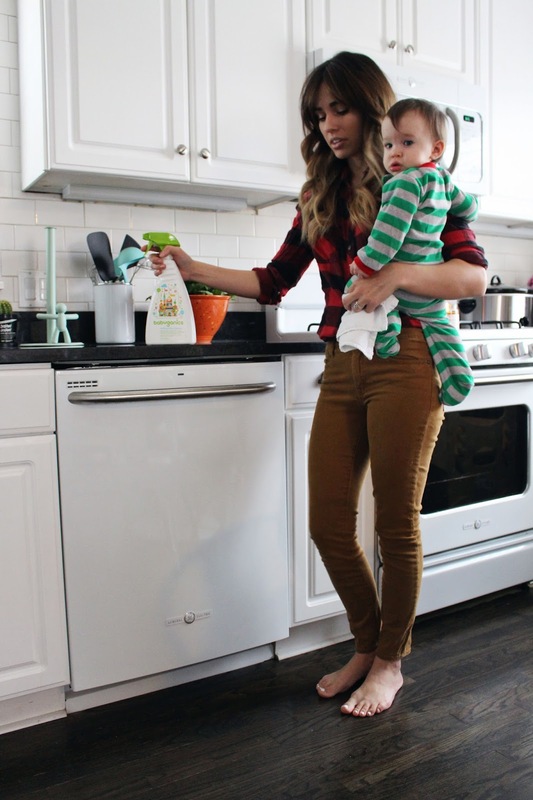 It's super easy, just grab and wipe #clean #momwin. I also love using their Multi Surface Cleaner. Once the kids go down, or our friends leave from a game night, I spray everything with this and give the house a good ol' scrubbin'. With my countertops shiny, I curl up with a good book, and whisper to myself #crushedit!